Flt Lt Phil Ainley DFC was accepted for aircrew training in February 1942 at the age of 17½ years. He was selected for pilot training and was sent to the United States Naval Aviation base in Pensecola. After gaining his United States Navy wings on completion of his Catalina flying boat course, he was commissioned and returned to the UK. Following retraining on land planes, he eventually joined No. 57 Lancaster squadron in May 1944. The squadron was heavily engaged in attacking both French flying bomb sites, the build up to D. Day and German industrial targets. One sortie to Konigsberg necessitated flying for 11 hours 10 minutes, whilst another was to drop mines in the Stettin canal from 250 feet. For this last sortie Flt Lt Ainley was awarded an immediate DFC. He completed his operational tour of 33 sorties in October 1944, having flown all this time with the same crew with the exception of a replacement flight engineer. On completing a course at the Bomber Command Instructors School, he became a flying instructor in Bomber Command. 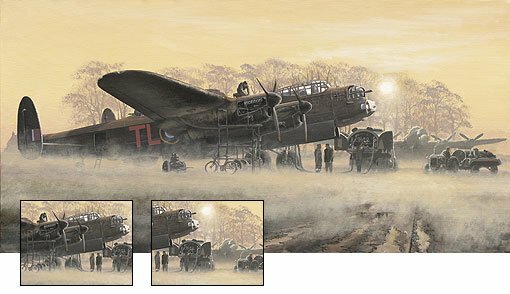 The Avro Lancaster was designed from the outset to build a bomber capable of reaching the heartland of the enemy. Put this together with Rolls Royce Merlin engines, and a superlative aircraft was born. No less than 59 Bomber Command units saw active service with the Lancaster, flying 156,000 sorties. Some 7377 aircraft were built by six factories producing five different variants of the Lancaster. Here is a typical wartime scene. Lancaster's from 35 Squadron are being prepared for yet another Pathfinder mission, with the ground crew busy servicing, rearming and refuelling the aircraft.
. Lt. Joe Petrie-Andrews DFC DFM joined the RAF at “about 14 or 15 years of age.” Rejecting the opportunity to become a bomb-aimer, Joe was determined to pester the RAF until they would accept him on a pilot’s training course. Flying mainly Lancaster and Halifax aircraft, Joe joined 158 and 35 Squadron’s, and later became part of the Pathfinder Force. During an operation to bomb Cannes in southern France on 11th November 1943, Joe’s (aged only 19) Halifax was badly shot up, forcing him to ditch the aircraft in the Mediterranean, where he and the crew spent three days in a dingy before being rescued; for this operation Joe was awarded an ‘immediate’ DFC. He completed 68 operations, 60 before his 20th birthday on 11/7/1944. Sqn. Ldr. Lawrence “Benny” Goodman (617 Sqn) volunteered for aircrew at 18 years of age and was called up in 1940. After basic training he went to RAF Abingdon – a Whitley O.T.U – for what he was told would be ‘straight through’ training. This did not materialise and he found himself in the role of a Ground Gunner. In 1941, a posting eventually came through to the Initial Training Wing followed by Elementary Flying School at Peterborough and an instructor’s course at Woodley, Reading; then to Clyffe Pyparde, a holding unit. A sea journey to Canada followed and Service Flying Training School on Ansons. On completion he was posted to Kingston, Ontario, to instruct Acting Leading Naval Airmen on the Royal Navy tactics of the time. e.g. jinking after take off, dive bombing etc. “However, I had to learn everything first - so I was just about one step ahead of the students" said Benny.